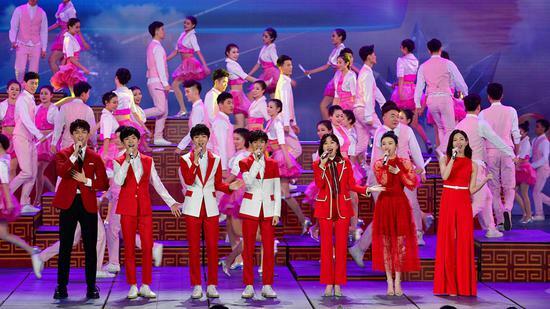 BEIJING, Feb. 6 (Xinhua) -- China's most-watched annual television show on Chinese Lunar New Year's eve has set a new viewership record, according to its broadcaster China Media Group. The 2019 Spring Festival -- the first day of the Year of the Pig -- fell on Tuesday. For many Chinese families, the CCTV Spring Festival Gala has long been a fixture of their new year celebration. The show usually runs for several hours through to midnight as family members stay up late to usher in the new year. This year, more than 621.4 million people in China and another 24.8 million overseas watched the show on television, while a surging number of viewers -- 527 million -- watched it on new media platforms: apps, websites, video-streaming sites and social media, the broadcaster said. It is the first gala since China Media Group was formed by merging CCTV, China National Radio and China Radio International. All three's channels were used to promote this year's gala. Online approval ratings of the gala hit a whopping nearly 97 percent, it added.